If there was a Mount Rushmore of golf, much discussion could be had about which faces belonged on the structure. Undoubtedly much would be said for including the likenesses of Tiger, Jack, Arnie, Gary Player, Ben Hogan, Sam Snead, Byron Nelson, Seve, Miller, Watson. In a game that is rich with legends it would be a great difficulty to name four to represent the sport for all time. However, it seems clear that there is one name that earned a spot on the proverbial monument the better part of a century ago. Bobby Jones has a legacy in the game of golf that is almost beyond belief. Long before big money entered the game, before television and corporate sponsorship and video games, Bobby Jones was asserting his dominance in his sport simply and purely for his love of golf. Today we will explore the life and career of golf’s greatest amateur. Bobby Jones was born in Atlanta Georgia in the year 1902. As a young boy, Jones suffered from health difficulties that left his body weak and frail. His doctor prescribed taking up the game of golf to him as a means of strengthening him. These efforts would prove to be more than successful. Like many of golf’s greatest stars, Jones was quickly understood to be a prodigy. By the age of six, Jones would win his first children’s event, and by the age of fourteen his prowess on the course would attract national attention. Jones would begin traveling with his game as a teenager, even representing the United States in several amateur events where he would by far be the youngest player on the team. During World War 1, Jones would see the country during a series of exhibition events that were organized to raise money to support the war efforts. While all of these accomplishments would serve to raise his profile, his career potential would culminate in 1920 when he qualified for the US Open at age eighteen and played the first two rounds of the tournament with legendary golfer, Harry Vardon. Many people familiar with the game today would be surprised to learn that Jones never officially became a professional golfer. All of his achievements were accomplished while he maintained amateur status, which means that he never accepted money for his victories. His career in tournament play would ultimately be short and sweet. He would win his first major (the U.S Open) in 1923. 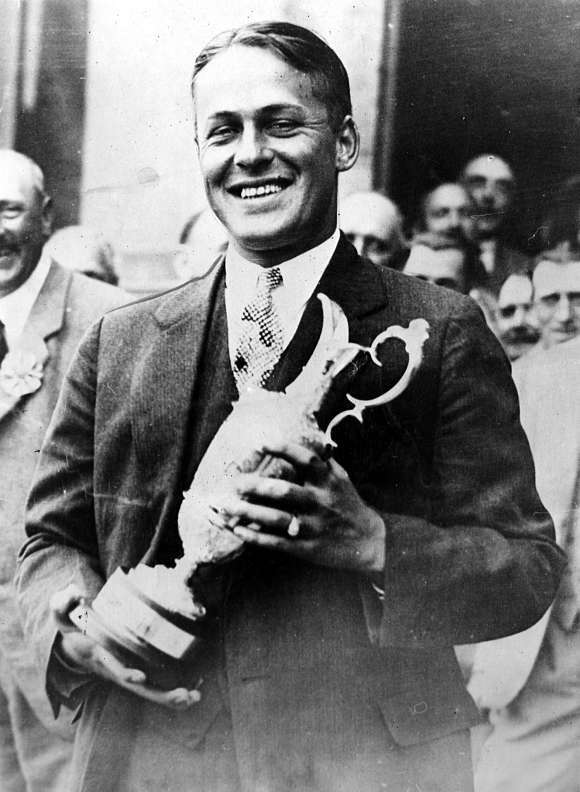 Between the 1923 season, and his retirement from competitive play in 1930, Jones would win thirteen out of the twenty major championships that he played in. Some sports scholars believe that he could have yielded even more victories had he not been such a stickler for the rules. Jones was well known for calling penalties on himself that even rules officials would attempt to convince him not to take. However, near misses, and minuscule rules violations aside, Jones’s tournament success would ultimately culminate into what many consider the greatest season of golf ever played. In 1930, Jones won the calendar grand slam – an achievement that then meant winning the U.S Open, the U.S Amateur, the British Open, and the British Amateur all in one season. In modern times, the grand slam now means something a little bit different, as the Masters and PGA championship have now replaced the amateur titles. Regardless, the grand slam in any variation was a feat that had not been accomplished before and has not been accomplished since. Despite the lack of historical precedence, Jones was very confident in his ability to accomplish this goal. At the beginning of the 1930 season he would place a large bet on himself to win all four titles. When he successfully achieved this feat, he would receive a payout of $60,000. Having reached the peak of success in the game, Jones would retire from competitive play. While Jones would never play professionally for money, he did eventually shed his amateur status after he concluded his tournament playing day in order to make a living designing clubs and instructing film stars on how to play golf authentically on camera. These lucrative ventures would ultimately help him to bankroll his creation and investment in the now legendary Augusta National. Jones originally founded Augusta National simply for the fact that he could not go to a public golf course without being bothered by the legions of fans he had accumulated during his tournament career. Jones was simply looking for a place where he could go to play golf with his friends in peace when he bought and developed a large parcel of land with his friend Clifford Roberts in Augusta Georgia. By 1933 the course would open, and by 1934 it would host its first Masters tournament. Jones would even come out of retirement to play in the tournament on an exhibitionist basis. During World War 2, Jones would serve overseas and suspend operation of the course in order to allow the government to graze cattle on the property in support of the war efforts. Today, The Masters tournament is the first major played during the PGA tour’s calendar season and remains one of the most prestigious events in existence. Today, the shadow of Bobby Jones still hangs over the sport of golf in a significant way. There are several things that will secure Jones as a gold standard of what it means to be a true and pure golfer. The first was his amateur status. In the early twentieth century it was not necessarily unusual for skilled players to maintain an amateur status, but that is not to say that he did not face pressure to start banking off his national profile. But he never did. Now, in a world where golf’s top players make tens of millions of dollars a year from tournament purses and sponsorship contracts, an amateur will probably never dominate the sport again, but the fact that it happened all those years back is still a source of admiration and respect many of today’s current icons. While the pressure today to bank off a proficiency at golf might be too great to resist for contemporary players, Jones’ true love and respect of the game remains to this day something that top players all over the world admire and reflect on. Then there is his greatest achievement of all (and perhaps the greatest achievement in golf). While the Grand Slam that Jones earned many years ago is not quite the same feat as it would be today, the man nevertheless accomplished something that literally thousands have attempted and failed at since: winning all four of the game’s greatest tournaments in one calendar season. Of all of golf’s greatest records, this may very well be one that is never matched, and by definition, it can never be beaten. Then there is the Masters. While casual fans of golf may not be exceptionally interested in Jones’ record as an amateur, or even in his major victories, everyone with even a feint familiarity with the sport knows the Masters. There are many people who will put a small asterisk next to Jones’ grand slam record for the reason that the tournaments he won do not account for the contemporary grand slam. This is true, but it is impossible to ignore the fact that part of the reason Jones did not win the contemporary grand slam was because he was busy redefining it. Today, not only is Augusta National one of the most exclusive and famous courses on the planet, it is also host to what many consider the game’s greatest contest. These three factors all account for a life and career that will remain forever unmatched. In 1948, Jones was diagnosed with a spinal cord disease that would eventually leave him in a wheelchair. In 1971, he would pass away from the disease, leaving behind a wife and son. The differences between how the game of golf is played now versus how it was played during Jones’ time are almost too many to list. While the overall rules are ostensibly the same, the equipment, the courses, and strategies are different in every conceivable way. In some ways that is a shame. Jones was a man of his time: respectful, classy, and above all else, determined. While the large purses and sponsorship incentives that characterize the tour will probably ensure that the game never sees a dominate amateur again, there is still much that can be learned from the level of respect and love that Bobby Jones had for the game. Golf’s reputation for tradition and a gentlemanly respect for the rules is due in no small part to people like Bobby Jones.